Some meetings are great. Some are terrible. Either way, they are a vital part of every organization’s work at some point. Meetings take time and coordination and are famous for inefficiency. They require physical travel to a designated room, and you have to remember call-in codes as you navigate A/V equipment. Then there are meetings that lack an agenda, are poorly run, or use precious time just to schedule. Some meetings almost always work best in person or over video—department- or organization-wide meetings, or manager/employee one-on-ones, for example—but we’ve found that some common meeting types can be eliminated entirely thanks to better team communication. 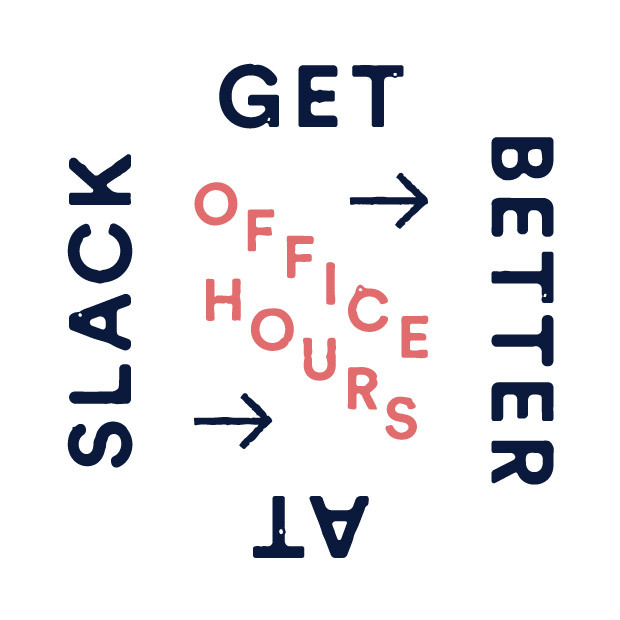 Let’s look at some ways Slack can help you when it comes to meetings. One of the best candidates to be replaced by activity in Slack is the daily status meeting. These meetings follow this pattern: Team members go around the room to let everyone else know what they’re doing today, what they finished yesterday, and anything that’s blocking their progress. Even if you limit each update to 60 or 90 seconds, it can be hard for the facilitator to enforce and prevent discussion creep. If, for example, you have a dozen people on your team, that’s at least 15 minutes every morning spent in these stand-ups, or three person-hours of time every day not spent working on projects. On my team at Slack, we use the command /remind every weekday at 9:45am Hey @editorial-team What’s on today? This sends a push notification out to our user group, and every member responds within a few minutes saying what they’re doing from wherever they are in the world—and then everyone goes back to work. It gives us visibility into one another’s work, and our manager can scan the responses, asking questions when necessary. My team is only half a dozen people, but if it were larger, we could still conduct a morning meeting this way if we confined our answers to a comment thread on the reminder message. It’s still a real meeting, but it takes just a few minutes out of anyone’s day from start to finish. Schedule a 30-minute slot and assign the brainstorm to a channel (you may want to create a new channel if your existing channels have lots of participants you might drown out). At the appointed time, have a facilitator give the prompt to the group, and let the ideas fly. In a written meeting, people don’t have to be concerned with talking over each other, and it can level group dynamics for quieter people who tend to participate less during in-person brainstorms. If anyone misses the meeting, they can later read the channel and even contribute new ideas anytime after the meeting is over. The best part of conducting any meeting in Slack is that when time is up, you’ll have an entire written record of the session that can be reviewed by others and pasted or organized into any other documents. This is another common way a Slack discussion can take the place of meetings, saving everyone some time and trouble. It’s easy enough to upload mockups or artwork, ask for votes using emoji reactions, have a quick discussion about refinements, and move on. There are dozens of Slack apps to help coordinate meetings. Two worth mentioning are Meekan and Kyber. Both let you message a bot to help you figure out when to propose meetings, find the best open times on the schedules of all your invitees, and let everyone vote on the available options for a meeting. Every good meeting should have an agenda, and apps like MeetNotes can help you formalize that in your office. Using an app like this, any attendee can view the agenda ahead of the meeting (ideally, when they get the invite), as well as add items they’d like to see covered. 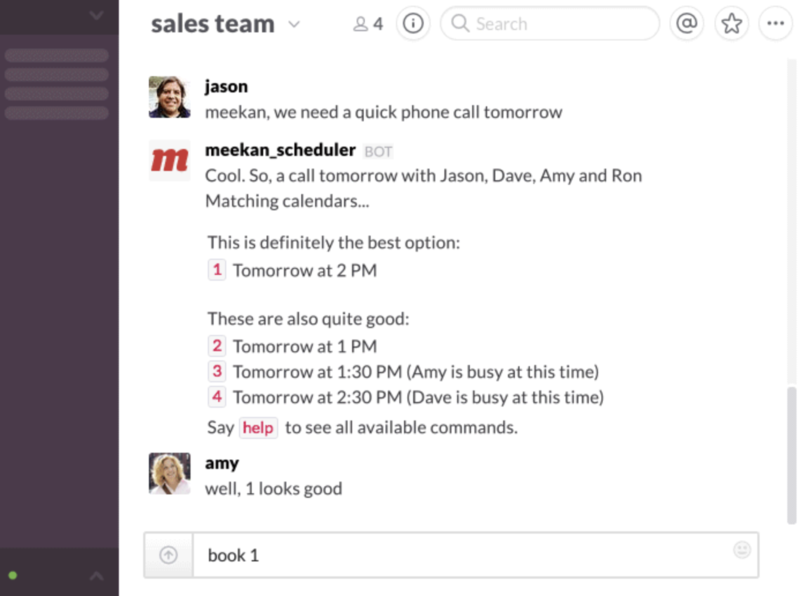 Finally, Slack’s built-in Calls feature offers not only audio and video calls (handy for remote employees and those across other offices) but also collaborative screen-sharing. This means you can have two people talking to each other, with each person’s own mouse controlling a pointer, along with the ability to interact with elements on a shared screen. You can use this feature to hold such meetings as two people writing code (also known as pair-programming), collaborating on an important presentation, or tweaking designs in apps like Photoshop together. We frequently hear customers say that using Slack helps them avoid meetings. This is partly because meetings can often be replaced by quicker conversations in Slack. But more important, consider how the work you’re already doing in Slack can eliminate the need for a meeting entirely. 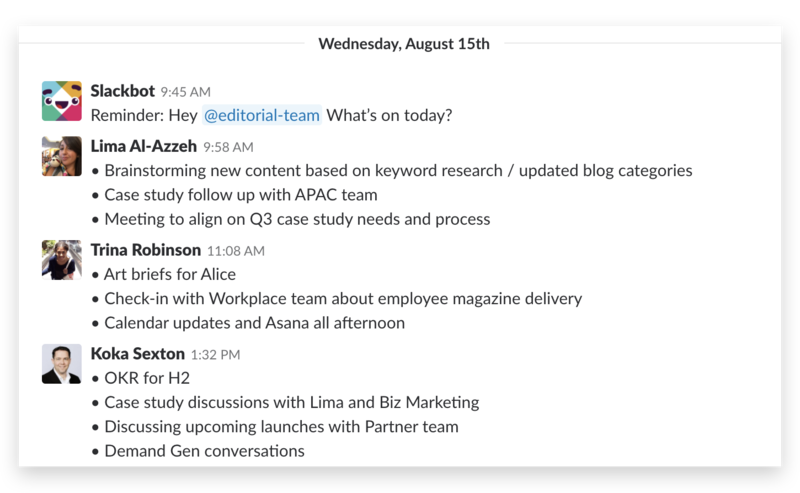 When teams communicate in well-organized Slack channels, you can read a single project- or team-focused channel and see regular status updates, read feedback on the work, and stay up to date on any delays. Anyone reading the channel can get a good handle on where things stand, often eliminating common reasons to call a meeting. The next time you review your schedule, ask yourself about all those meetings already listed on your own calendar: Is this meeting necessary? and if so, Would it be better held in Slack? or Could this instead be summarized after reading our team’s channel? There are times when a large company meeting is good for morale. But other times, it’s not worth taking hundreds of highly paid people away from their desks and into a room to hear about, say, new health-care or retirement plans. Frequent and regular updates of more mundane company information can easily be shared in your company announcements Slack channel that everyone is likely to see.